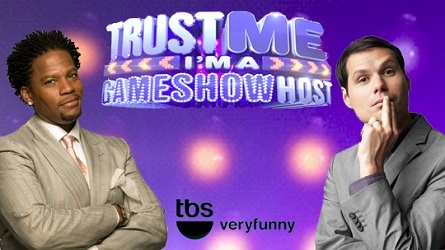 During a recent visit to the set of new TBS game show, “Trust Me I’m A Game Show Host”, Hollywood Junket Assistant Editor brought us back the following report. The show is hosted by Michael Ian Black who has appeared in movies such as “This Is 40”, and “Take Me Home Tonight”; the other host is comedian D.L. Hughley. He has appeared on “Dancing With The Stars”, and created the television show, “The Hughleys”. The stage is a circle that is surrounded by audience members. In the middle of the stage three podiums stand; there is one for each host and one for the contestant. The show begins with Michael saying a joke in regards to lying. He jokes about how lawyers and politicians lie but everyone still loves them. The two walk down a couple of steps, the audience cheers as they introduce the contestant. A young bubbly African American woman walks down the stairs smiling at the cheering crowd. Compare the game play to the ABC version of the game show here. The game is quite simple and highly entertaining. Each contestant gets a chance to win a total of $15,000 throughout the game. In the bonus round they can win $20,000 more making the grand prize $35,000. In the first round, the contestant can win $1,000. Each host tells them a statement, one of which is lying. Each host must try their best to convince the contestant what they are saying is indeed the truth. Each audience member has a clicker allowing him or her to participate and pick which one they believe is the liar. Some of the “facts” read sound ridiculous, however some turn out to be true. In the bonus round, the contestant is given five statements, one of which is the truth. This time the category was called “first time,” and it included statements about I Love Lucy, Twitter, and Billy Joel. The contestant can lose up to three lies, giving them a fifty-fifty chance at winning an extra $20,000, however it will cost them $6,000. It costs $1000 to lose the first lie, $2000 for the second, and $3000 to lose the final lie that will grant them a fifty-fifty chance. 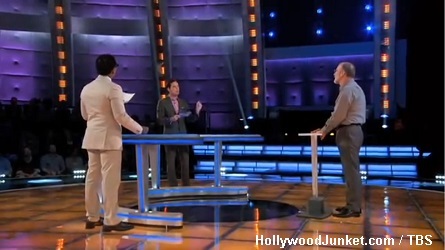 Pictured: Two hosts tell a contestant their fact is true. The game gets quite intense during the final round, because audience members begin to talk to one another discussing what they believe is the correct answer. They are not supposed to; however, it becomes difficult to remain silent. You want the contestant to make the right decision, and win the game! 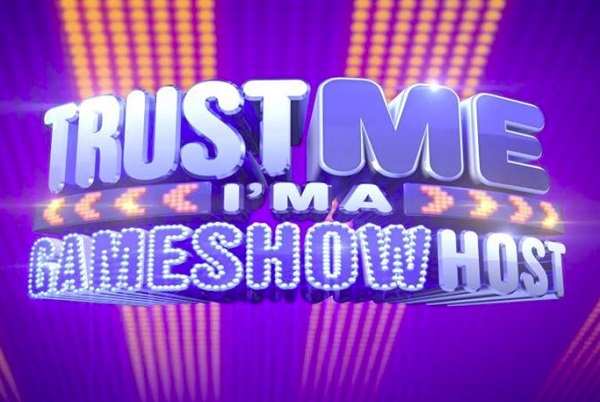 “Trust Me I’m a Game Show Host” premieres Tuesday, October 22, 2013 on TBS.